When her Alice in Wonderland-loving daughter Belle turned nine, Heidi Stevenson thought an Alice-themed party would be just the thing. Venture through the looking glass with us to see Belle’s beautiful party, but watch out for mad hatters and tetchy queens, and whatever you do, don’t talk to any cats. 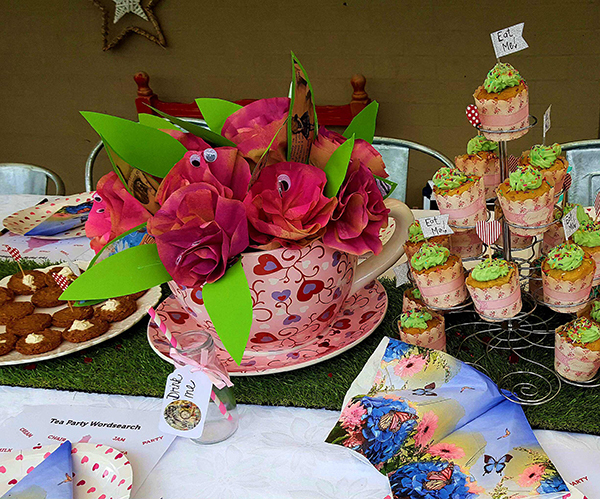 When Heidi Stevenson set out to create an Alice in Wonderland-themed party, she didn’t count on how hard it would be to find Alice-themed merchandise in Australia. Up for a good challenge (and like all of us, keen for a bargain), Heidi put her creativity to the test and made most of the decorations and food herself. It took about six weeks to source and create all the decorations for the party, but the result was well worth the time spent. 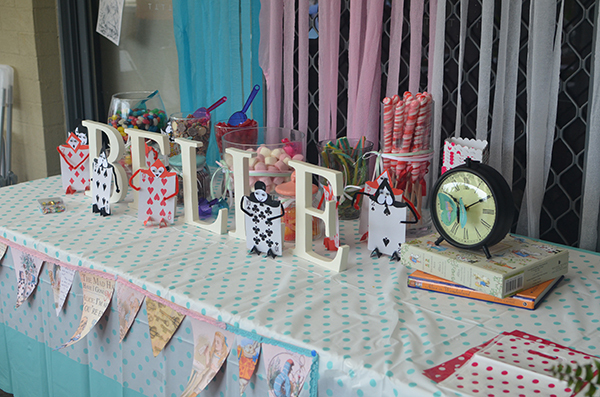 Tables were decked out with all kinds of Alice-themed kit, inspired by the book, the classic Disney movie, Tim Burton’s version and a hefty dose of Pinterest for good measure. Bunting flags were made from printed Alice in Wonderland images stuck on cardboard and hung from decorative lace that Heidi bought at Kmart. Using a clever tutorial she found online, Heidi gave new definition to the idea of living flowers, creating flowers from spray painted coffee filters and giving them construction paper leaves and googly eyes. Bunches of flowers were placed in oversized tea cups that sat along the table. Games were a big hit at Belle’s fete. 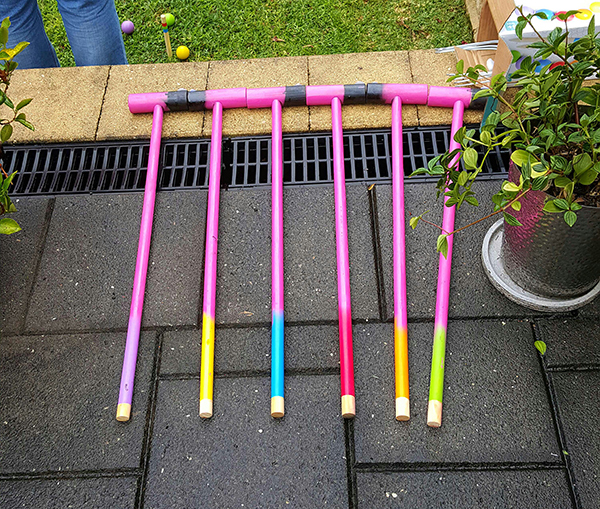 There was the obligatory croquet game, complete with croquet mallets painted pink and black to look like flamingos. For Pin the Grin, kids were blindfolded and had to stick the grin on a giant printed Cheshire Cat. Heidi admitted to a bit of madness when trying to make the cake. She chose a Donna Hay red velvet cake with marshmallow icing, the idea being to make it into a mad hatter cake covered in fondant. 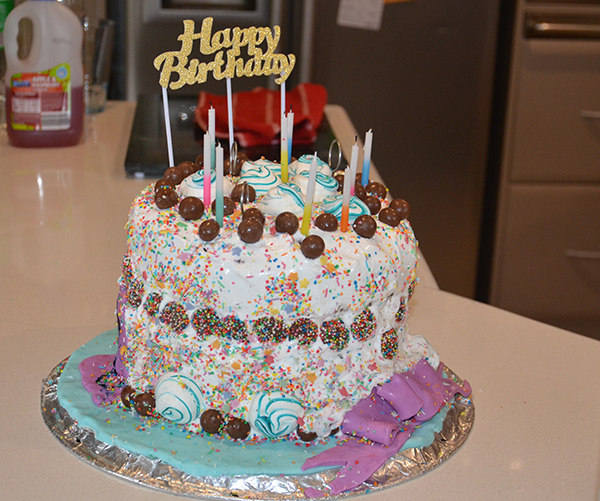 The fondant refused to stick to the marshmallow icing, but handfuls of sweet lollies came to the rescue and the kids loved the result. 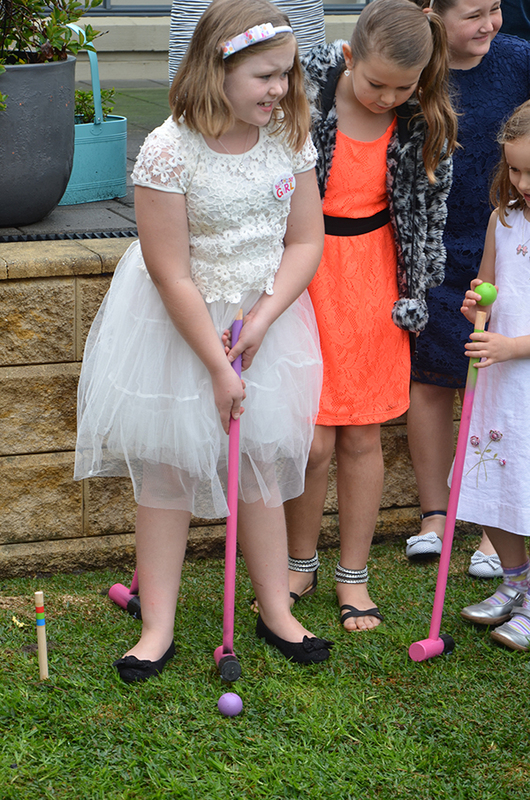 The party was a big hit with the birthday girl and all her friends. Heidi has set the bar so high for next year’s party, she might have to double the party planning time to 12 weeks rather than six. 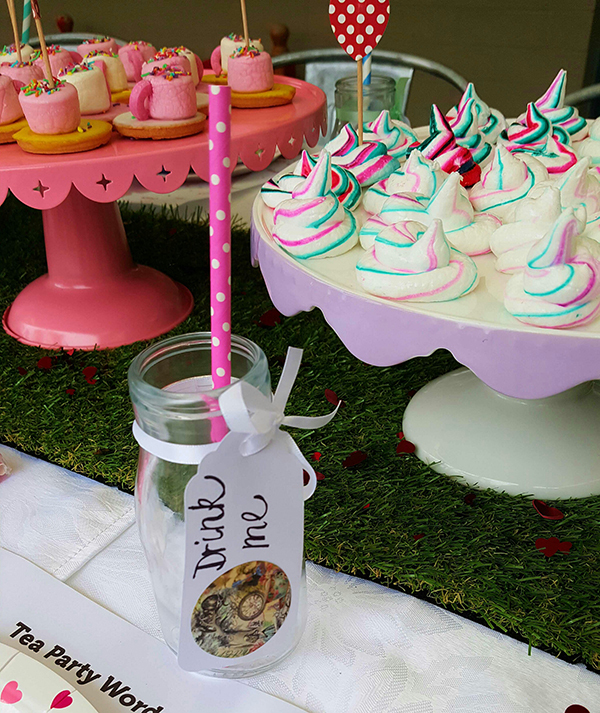 For more Alice party ideas, take another look at this Wonderland-themed party our own Babyology editor Nikki threw when her daughter turned five.